No other economist in recent times has been so closely identified with the Austrian School of economics as Israel M. Kirzner, professor emeritus of economics at New York University. A leader of the generation of Austrian economists after Ludwig von Mises and F. A. Hayek, Kirzner has been recognized as one of the minds behind the revival of entrepreneurship and market process theory in the twentieth century. 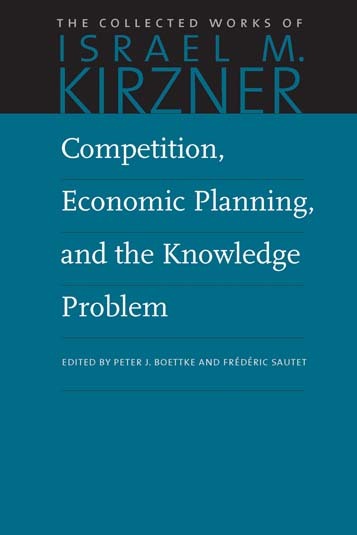 Competition, Economic Planning, and the Knowledge Problem expands on the ideas Kirzner first discussed in Competition and Entrepreneurship—the role of the entrepreneur and its relation to the determination of prices and the coordination of individuals’ plans—as well as economic planning, the knowledge problem, market-process theory, and the parts played by information, knowledge and advertising. It includes a paper on F. A. Hayek’s theory of market coordination and the Austrian business-cycle theory—seen now for the first time in its original English. Over the course of this book’s nineteen articles and one monograph, Kirzner stresses the fundamental idea that competition is a rivalrous process of entrepreneurial activity in which individuals and firms discover, innovate, and outdo each other. Kirzner discusses why this dynamic view of the market process is so important to understand, particularly in the contexts of economic planning and the workings of competitive markets. In Kirzner’s view, free market competition has epistemic properties that cannot be replicated in other ways. Indeed, though knowledge is present in all economic interaction, it is also dispersed in the economy such that no individual mind can ever centralize it all. This “knowledge problem” implies, as Hayek has argued, the impossibility of central planning. Kirzner’s contribution is to show that, ultimately, it is only the free, competitive entrepreneurial process that can overcome this problem through generation of knowledge that enables a relatively efficient, yet perfectible, allocation of scarce resources. Frédéric Sautet is Associate Professor at The Catholic University of America, Tim Busch School of Business and Economics. He is a specialist in Austrian market process theory, and he teaches entrepreneurship studies. He is the author of An Entrepreneurial Theory of the Firm and has published widely on entrepreneurship.